Pork fillets are easily obtainable and relatively inexpensive, but the best thing about them is they usually come with trimmings attached to them which must be removed before cooking; and with these trimmings you can make a quick and delicious homemade sauce with no pre-made stocks or artificial seasoning. Just simple fresh ingredients. 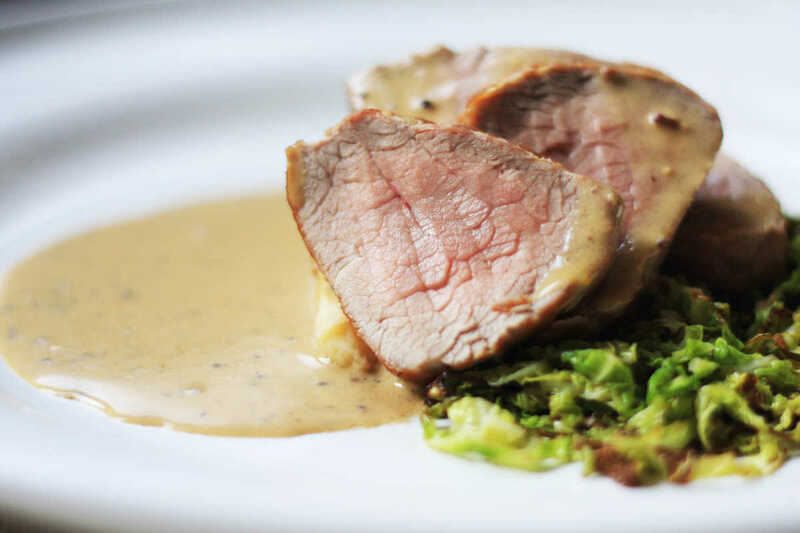 This recipe is one of the easiest and most delicious things to do with a pork fillet, and personal favourite of mine. Grain mustard is a classic pairing for pork, and combined with creamy mashed potatoes and cabbage, it’s an absolute winner! Heat the oven to 170C. Prick the potatoes with a skewer, then place in the oven for about 1hr 30mins, until soft and cooked through. Cut the potatoes in half, then scoop the potato from the skins and either mash with a masher or pass through a sieve. Place into a wide-based pan, and over a medium-low heat, add ½ teaspoon of salt, and mix. Add 30g of the butter, one dice at a time, then add the milk. Continue to cook out until you have a completely smooth, silky texture. Adjust the seasoning with salt and white pepper if need be. While you’re waiting for the potatoes, make the sauce: trim the pork fillets of all sinew, and cut off the small head or “chateau” from the end. Cut all the trimmings approximately 1cm dice. In a large, heavy-based pan, heat 1-2 tablespoons of vegetable oil over a high heat. Season the trimmings with salt and black pepper, then fry until golden all over, and strain in a colander. Meanwhile, thinly slice the shallots, and crush the clove of garlic. Add the shallots, thyme, bay, sage and garlic to the same pan and turn the heat to medium. Add a pinch of salt, and gently cook the shallots for about 10 minutes, until they are soft. Add the pork trimmings back to the pan, along with the brandy. Boil, and reduce until completely dry. Now cover with cold water, and boil to reduce until dry. Repeat this 3 times, but on the last time, only reduce by half, then strain the sauce into a separate pan. Add the cream, and continue to reduce until you have a nice sauce consistency. Lastly, add the mustard, and mix. To cook the pork fillet: heat 2 tablespoons of vegetable oil in a large heavy-based pan over a high heat. Season the fillets all over with salt and white pepper. Fry the fillets all over until golden and caramelised. Place the pan in the oven for 3 minutes. Remove from the oven, and add the remaining 25g butter. Heat until foaming, then add 1 sprig of thyme and 1 crushed clove of garlic. Baste the pork fillet for about 2 minutes, turning over after 1 minute. Cook until the pork is still slightly pink in the middle. Transfer to a rack and leave in a warm place to rest for at least 10 minutes. Prepare the cabbage: Remove and discard the dark green outer layers. Take the inner leaves off and remove the woody veins. Thinly slice the cabbage, then set aside. Heat a little vegetable oil in a wide-based pan over a medium-high heat, and sauté the cabbage, with a pinch of salt, until lightly coloured. Turn the heat to low, then add the remaining 10g of butter. Cook gently until cabbage is tender taste, and add more salt if needed. To serve, place a spoonful of the mashed potato in the centre of the plate, with a spoonful of cabbage next to it. Slice the pork fillet, and place on top. Spoon the sauce over.